Generating more than £1.5billion annually, Aberdeen Harbour is an economic powerhouse for Scotland. It’s also a major global business, with links to 39 countries worldwide. Add to that earning the title of the UK’s oldest business, with the first transaction recorded in 1136, it has the perfect combination of credibility, ambition and a great brand story. Our work around the brand was carefully and consistently developed through an extensive programme comprising PR and media relations. This work enhanced vital engagement with all stakeholders, from existing customers to the wider business community, and from politicians and local council members to those who call the area around the port home. We would bring the Harbour’s story to life through widespread media coverage of the port and its people, to securing a prime time television series. 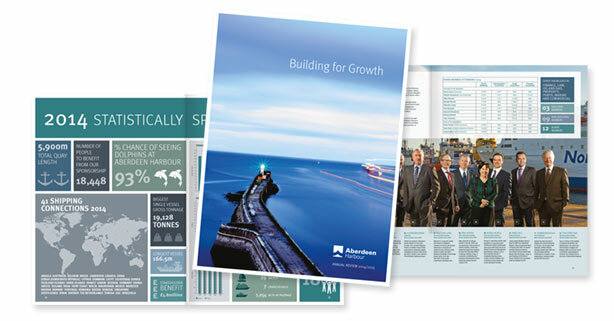 Taking the theme of engagement further, working together with the team at Aberdeen Harbour, we didn’t just create their annual report. We reinvented it, transforming it into a magazine-style publication, adding stories from the Harbour’s archive to bring it to life, including stories such as Harry Houdini’s famous escape attempt. This story-telling approach transformed the review’s look and feel. Something recognised by the Association of Marketing and Communication Professionals in the United States, earning Fifth Ring a platinum HERMES award for our efforts. This put us in a favourable position to craft a new website for the Harbour Board. Armed with an award-winning design structure, we could create a new site that would reflect this distinctive look and feel and integrate it with a new vessel data system, positioning it internally as an engaging and helpful communication tool and to allow it to be a portal for both staff and customers. We implemented a new CMS so that content could quickly and easily be shared in order to keep the site dynamic as well as fulfilling the constitutional requirements of a Trust Port. New systems for vessel data management were seamlessly integrated and now the Aberdeen Harbour website holds a wealth of information about the port for all of its stakeholders. We ensured the same design team that created the Annual Report contributed to the web design, starting from scratch with every page. This design was then translated by the digital team to optimise screen and CMS. We distilled the information for the site into a series of information bites, keeping the information fresh, easy to digest and easy to update. We then ensured the site was responsive. An increasing number of people are accessing the web on smartphones and tablets, so the site would work seamlessly on these platforms, without any need for CMS users to create additional or constrained content. This new site is an excellent piece of work. It not only looks fantastic, but also performs brilliantly. 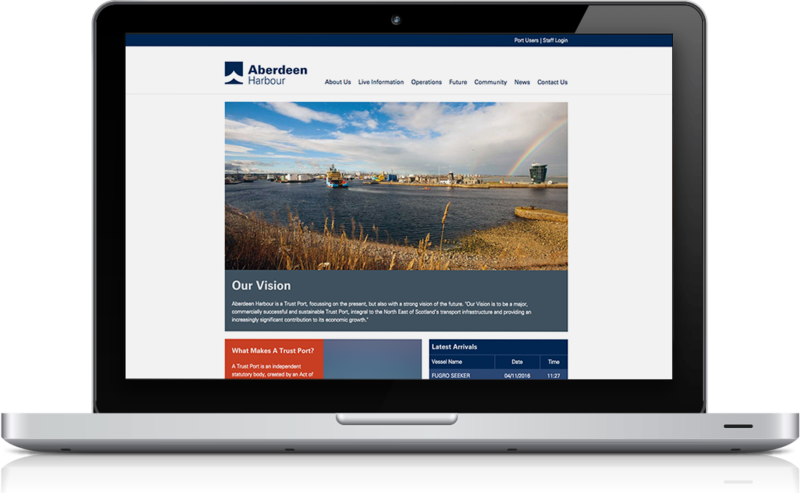 The new site perfectly reflects our plans for the future, and will take us forward, ensuring our online presence will forge the way ahead Aberdeen Harbour Board.